If you need help seeing how your new project may look together, try out our our Kitchen Visualizer. This tool allows you to preview different countertops, backsplashes, cabinet colors, and flooring! To choose the best countertop replacement for your kitchen, talk to our sales and design professionals. These are experts who know everything there is to know about the different types, styles, brands, and colors of counters. Discuss your design style and lifestyle requirements with our professionals and let us help you come up with counters that complement your décor and offer easy cleaning and maintenance. Many of our customers prefer countertops made of stone. These have the unique beauty of the slabs of stone from which they originate. Stone is heavy, dense, and durable and so it makes a strong surface material. Granite and marble are two of the most popular choice among area homeowners today. Granite is the heavier of the two and visually appealing with its pattern of flecks and swirls. This surface is easy to keep clean for it resists bacteria and germs; all it takes is a gentle granite cleanser. These countertops are also resistant to heat and fire. Marble is valued for its beautiful veining. As this stone is quarried from the earth, the pattern is unique to each slab. This stone is naturally cool to your touch, so it is a natural for a hot room like the kitchen. Marble is a softer stone and is easier to cut and shape. Consider the ease of care of solid-surface countertops. As they are enhanced or made of man-made materials, they have a smooth, non-porous surface that does not have any holes for water, food, bacteria, or germs to hide. Thus, they are hygienic, which is ideal for a room where food is prepared. They are also easy to clean. 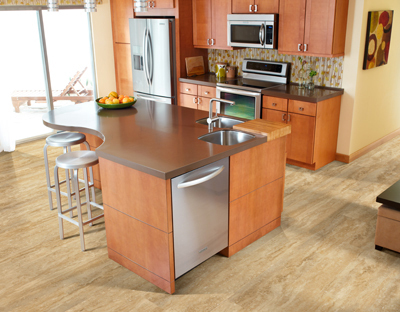 Choose from engineered quartz or laminate. Engineered quartz countertops are made almost entirely of quartz, but with a tiny bit of resin and pigment added. This makes the surface smooth and easy to clean. With the pigment added, quartz comes in a variety of stunning colors. Laminate is a manufactured surface that makes ideal countertops. Three of the most attractive features of this kitchen countertop material are that it is manufactured to be beautiful, strong, and easy to maintain. In addition, laminate countertops resist heat. When it is time to replace your countertops, ask us about the features of the different materials and then request professional installation. We send take the time to ensure a perfect fit with beautiful results. Contact us now for your free in-home estimate for new kitchen countertops. We are convenient located to serve customers in and around Fort Myers, Coral Gables, Punta Gorda, Bonita Springs, and Naples, Florida.